Playing detectives or just driving that imaginary car becomes even more fun if you use Free Printable Licenses and ID Cards! Pretend play is awesome! Kids can use printable masks to make things super fun or just let their imagination run wild! As a kid I was always the smartest and most awesome detective who could solve pretty much every crime and every mystery (in my mind at least) – I had my detective card to prove it – I even think it stated I was the best detective. Me and my neighbor also had the driver’s license so that we could drive around in my Dodge Viper or his Mustang. Naturally those two were made out of cardboard or just thin air. Spies always have the coolest gadgets and the most dangerous missions – no wonder kids love to play secret agents! I’ve created two versions – blue and pink and they both have a front and back side. On the front side kids will glue on their photo or make as mall drawing of themselves and write down their secret agent code name. On the back of this pretend play ID cart they will “have to” put on their fingerprint and some basic information. 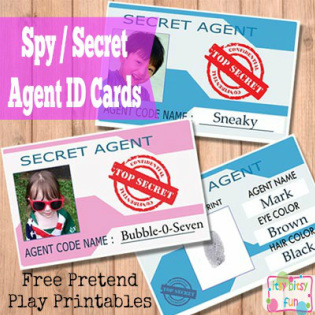 Get your Secret Agent / Spy ID Card Template for Kids here – version one. Get your Secret Agent / Spy ID Card Template for Kids here – version two. If you have a car in your family I’m sure your kids spend a lot of time pretending to drive their own car. It’s just one of those things that grown ups do and kids like to imitate it. I’ve created 3 simple pretend play driver licenses, each of them requiring a photo or a drawing of the kid and name. 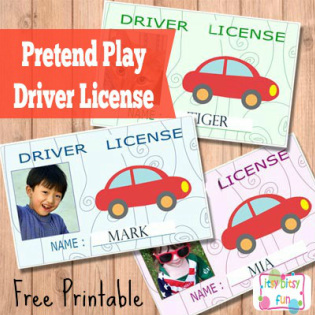 Get your free printable Kids Pretend Play Driver Licence here. 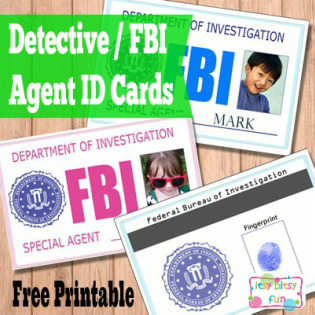 Get your free printable FBI Agent / Detective ID Card for Kids here – version one. 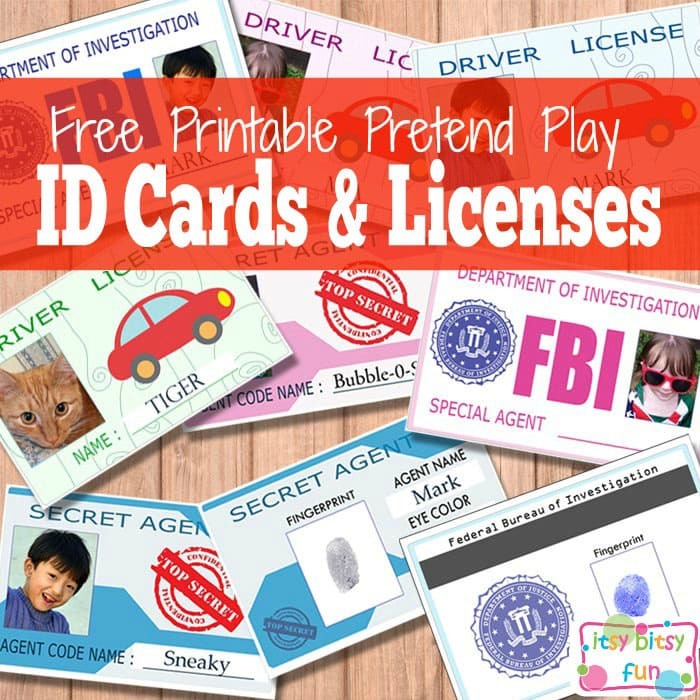 Get your free printable FBI Agent / Detective ID Card for Kids here – version two.